Our stucco exteriors are an attractive option that offers beauty, value, and durability. With an endless choice of colours, acrylic stucco provides vibrant curb appeal to any home or business. It resembles paint, in a way, but a very high quality one, that has sand in it, to give the finish a little more definition. The colour is typically very rich and vibrant and very consistent, meaning that there is virtually no colour variation from one bucket to another. 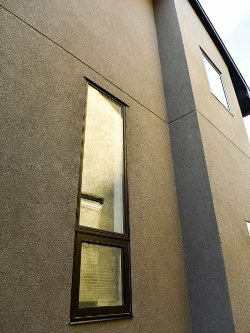 As the stucco product is essentially manufactured on site, installation skills are paramount to providing both the protection of a proper exterior envelope and the long lasting beauty of the final coat. 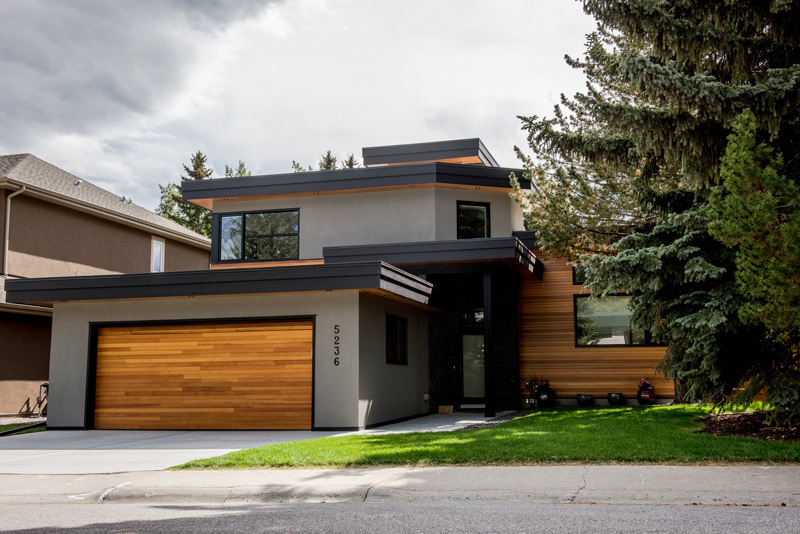 RidgeCrest Developments is a reputable stucco contractor in Calgary with a team of highly-skilled professionals to ensure that you are pleased with your stucco installation. 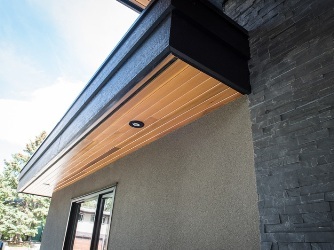 Stucco is a great option for your exterior as it repels water, is resistant to cracks and is much less maintenance compared to other traditional finishes. Unlike siding or wood, it does not need to be repainted or reinstalled every few years. The other advantage is that it can provide you with a more energy efficient home or business and potentially reduce your heating and air conditioning costs. RidgeCrest offers exterior insulation finishing systems (EIFS), which are multi-layered exterior finishes ̶ 6 layers to be exact. The first is a water-resistive barrier followed by an adhesive to attach the next layer, the foam insulation board, to the supporting structure. A base coat of acrylic cement material is applied to the insulation, which is then reinforced with a glass fiber reinforcement mesh. The final layer is a textured finish coat that is typically decorative and protective. These layers bond together to form a wall covering that is weather resistant and vapor permeable. 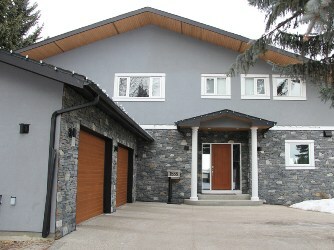 Choosing stucco in Calgary offers a variety of looks that can appeal to all tastes. It is a modern, stylish option to help your home or business stand out and look its best. Our team can help you select the perfect color and look to complement your home’s design and landscaping. It can be overwhelming to repair stucco damage on your home or business, but RidgeCrest Developments is here to assist you from start to finish in all of your repair needs to get your home or business safe and functioning in no time. 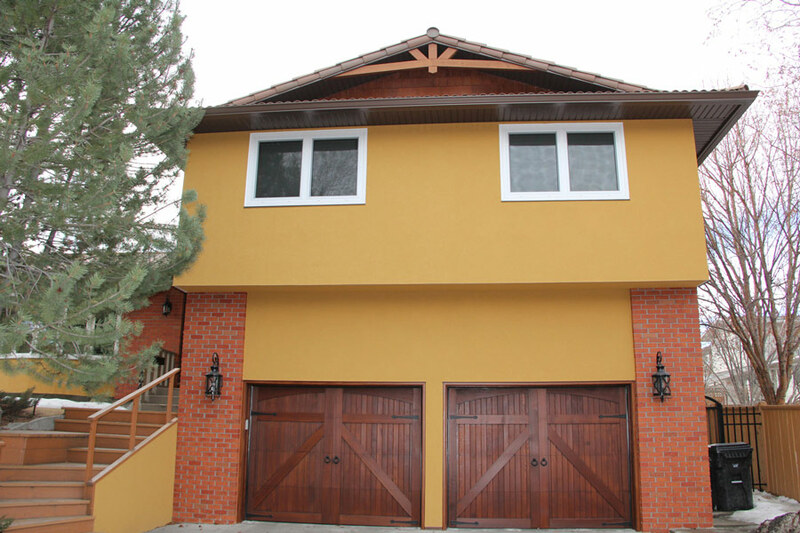 We have years of experience with stucco repairs on homes in and around Calgary. RidgeCrest provides you with comfort being specially trained stucco painters that will produce results that you will love. Having a fresh coating of paint will beautify your home or business and retain its good looks throughout the years. The textured surface of stucco can make it tough to paint, so let RidgeCrest take care of it for you.